Antartidee is an Italian design company dedicated to all those who love surrealism and afford Salvador Dali – heroic status. Founded in 1986, in Reggio Emilia by Roberto Ferioli and Mauro Montermini, each piece is handmade and also decorated by hand in Italy with all collections designed and created by the two founders. 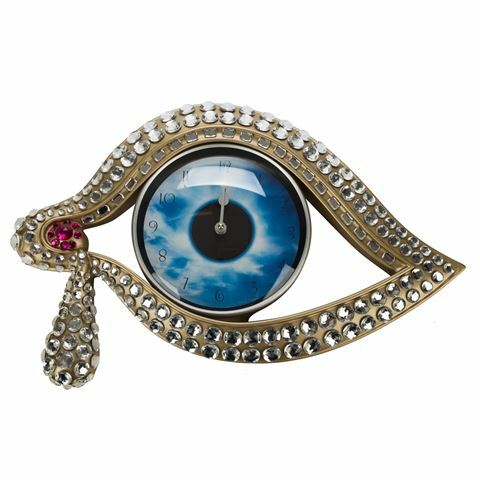 The Eye Of Time Wall Clock is destined to be a statement piece in your home or office, although no eye could look more beautiful, crafted from gold painted resin, surrounded by large crystals and with a crystal tear forming. Dimensions: 52cm (l) x 32cm (h) x 6cm (w).